With the busy shopping season approaching, including Black Friday, the biggest shopping day of the year, Printdesigns is offering retailers an extra edge to boost sales. Its cardboard display stands are affordable and effective to use as POS campaigns, persuading buyers waiting in queues to add something extra to their basket. The Easy Fold Cardboard Display is the ideal convenient solution for retail stores, cafes and other environments looking for low cost point of sale display systems. 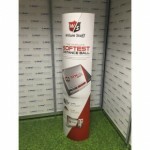 Any desired business or product design is printed onto the automatic pop up stand, then laminated with a gloss finish. With research suggesting 50-80% of consumer sales are made in store on impulse, a bulk POS campaign can really help to drive sales for all types of retailers. The cardboard displays are double sided, with full colour printing on both sides onto Kraft cardboard. The Easy Fold displays are available in 14 different sizes, from small desktop stands to full standing units to grab attention. They are also easily flat-packed for transport and storage, and simply pop up when needed. The lightweight, innovative stands are perfect for bulk marketing campaigns, especially at point of sale. To fully cash in on the peak shopping season and encourage Christmas shoppers to buy more, there are certain design traits which should be used for POS displays to ensure they are as effective as possible. With so much competition between retailers, precise marketing campaigns and targeted POS displays are crucial to entice shoppers.